I was on your website because I need a guard shack for my facility. I was impressed by your selection, but I’m confused by your mobile guard shacks. I didn’t know that guard booths could be portable and now I don’t know what structure is best suited for my needs. Can you explain the purpose of a mobile guard shack and why someone would need it? Thank you. Thank you for your interest in our guard booths. Shelters Direct has an extensive resume of guard booth projects, so you’ve come to the right place. To get you on the right track, let’s talk a little about mobile guard shacks. 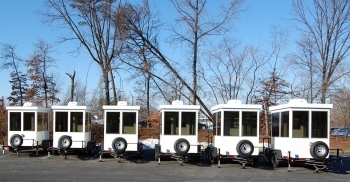 The mobility you have with Shelters Direct’s guard booths promotes efficiency while keeping your staff protected and secure. 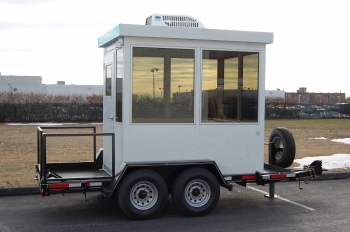 A common question we receive is, “why would my facility ever need a mobile guard booth?” You might be surprised why our trailer mounted booths are so popular. Read below for more information. A common customer who purchases our trailer mounted booths are military and government bases. The convenience of mobile security is the biggest selling point for this type of customer. Many military bases purchase these booths so they can move security personnel around their base with ease. Also, military entities regularly enact military exercises, so they mobilize their booths to create secure access points in minutes. Our portable guard booths can also be manufactured as a bullet resistant structure and that makes them ideal for any military or government facility. Facilities always have to be aware of the elemental factors that can threaten their geographic location. Many customers who are stationed in “flood zones” enjoy the convenience of having a trailer mounted guard booth. When bad weather is on the horizon, these facilities move their guard booths to a protected area so the booths do not get damaged. We usually see this type of customer in locations close to coastlines. Trailer mounted booths are also more cost-effective for facilities in hurricane-prone areas. Hurricane glass is required for any stationary guard booth located in areas that commonly experience hurricanes. Facilities do not need to worry about installing hurricane glass if their booth is mounted on a trailer because they can physically move their entire structure to a secure area. Companies building secure facilities utilize their trailer mounted guard booths to move from project to project with ease. Larger construction sites can last for months and security needs to be present. Our guard booths can provide access control point protection. Once construction is completed, the company has the ability to move the booth to the next project site. This takes the concern for security out of the equation so time and energy is directed towards completing the project. 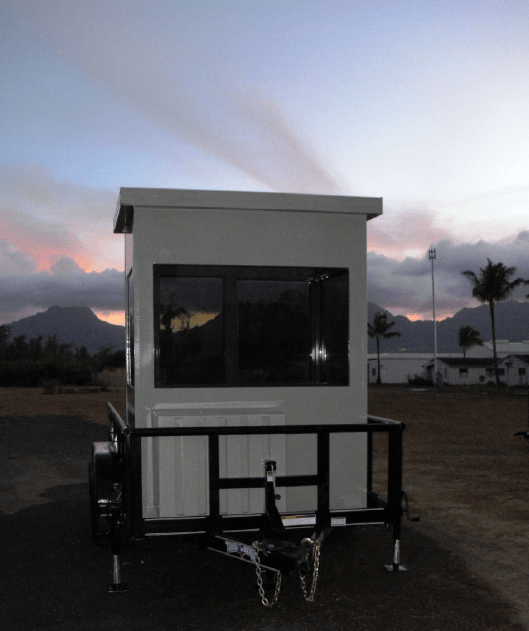 If a trailer mounted guard booth sounds ideal for your facility, it’s important to understand the unique considerations of a portable structure. The first thing to consider is sizing. How big do you want your structure to be? Shelters Direct offers two specific sizes for its trailer mounted booths. Because these booths are a smaller size they do not have the ability to be fabricated with a sliding door. The only type of door that is offered on our trailer mounted guard booths is a swing door. If a trailer mounted booth is a good investment for your company because you can move it to different locations, you will most certainly need to register the trailer for transportation purposes. Shelters Direct can provide you with a certificate of origin and you will need to register the trailer if you plan on moving your booth from location to location. This requirement is different for government facilities, so please discuss your concerns with our team and we will navigate you in the right direction. As always, we are here to walk you through your entire process. If you have any other questions about trailer mounted guard booths please let us know and our team will work hard to assist you. This entry was posted on Friday, November 4th, 2016	at 2:14 pm	. You can follow any responses to this entry through the RSS 2.0	feed. Both comments and pings are currently closed.